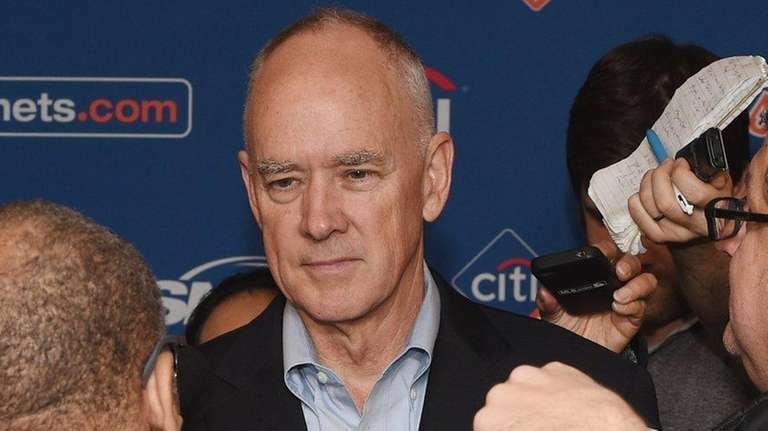 Mets general manager Sandy Alderson has been diagnosed with a treatable form of cancer, the team announced Friday. Beginning next week, he will undergo eight to 12 weeks of chemotherapy. Treatment will keep him from attending next week’s winter meetings in Nashville, Tennessee. Alderson, 68, missed the general managers’ meetings in Florida in November to have the unspecified medical procedure. During treatment, Alderson will remain engaged in the decision-making process, though he will do so remotely. Alderson triggered concerns about his health when he collapsed at the team’s end-of-year news conference Nov. 4 at Citi Field. After announcing that Terry Collins will return as manager next season, Alderson met with reporters to the side of the podium and suddenly collapsed. He was down for about 30 seconds, and after being helped up, he quipped, “OK, where were we?” At the time, a team spokesman said Alderson didn’t have breakfast before the news conference and felt lightheaded. Wilpon said the Mets will not disclose anything further on Alderson’s health, nor will they provide updates, citing his desire for privacy. On Tuesday, Alderson was named Baseball America’s Major League Executive of the Year. The Mets finished the season 90-72 and reached the World Series, where they lost to the Royals in five games. Now Alderson will lean heavily on his top lieutenants, though it is not unusual for Mets executives to work remotely. Paul DePodesta, vice president of player development and scouting, often works from San Diego. J.P. Ricciardi, a Mets special assistant to the GM, often works from his home in Western Massachusetts. Assistant GM John Ricco is based in New York. All three will be part of a contingent that will attend baseball’s winter meetings, which begin Monday in Nashville.